There are sooooo many apps out there which propose to save or win you money. And I have probably played with most of them! So here's a quick comparison to save your time and help you figure out which ones will actually be most useful to you. I'm going to lump these apps into two categories. 1) Coupon/Money-Back Apps which help you to save money on your regular expenses -- basically, you buy stuff and then scan your receipt, and 2) Free Money Apps where you don't have to spend anything, but you'll be taking surveys or watching advertisements to earn a little, or potentially win a lot, of money. Ibotta - I have had the best luck with Ibotta by far. They seem to have the largest selection both of participating stores and offers. I have gotten over $150 back in the couple of years I've been using it, primarily just through groceries and just by buying what I would normally buy. There are a variety of participating stores, though, ranging from restaurants to department stores to specialty shops. Over the last year, they've added cash back offers for online shopping as well! This isn't something I've remembered to try yet, but it seems promising. (I always kick myself after I place an order online and realize I didn't do it through any of my cash back apps.) The pay-out threshold is $20 (meaning you have to have earned $20 back before you can redeem it), and they offer both a variety of giftcards that you can redeem -- or Paypal! I always redeem to Paypal, and then withdraw from Paypal into my checking account. It's an extra step -- but then, hey, it's cash that you can put towards anything. Checkout51 - Checkout51 is similar to Ibotta, but I find their selection of stores and offers to be more narrow. If you think of the coupons you'd get in a Sunday newspaper, that's about on par with what you'll find in Checkout51. It's somewhat rare for something on my shopping list to actually have an offer available in Checkout51, but I have earned over $25 back in probably a year and a half of use. Sometimes I find something with an offer in both Checkout51 and Ibotta, and it's a great day when you can get double cash back on something like that! After $20 you can request a check, and yes, they actually do send you a paper check in the mail. Receipt Hog - Receipt Hog is a little different. There are not specific coupon-like offers. You just scan your receipt and earn "coins" depending on the total dollar amount spent. They do pay attention to receipt category, though. Restaurant receipts will just earn you a sweepstakes entry for their monthly drawing. Specialty stores or, I think, clothing stores will earn you spins on their slot machine wheel where you can win "coins"... 1000 coins can be redeemed for $5 in either Amazon or Paypal. As of this writing, there is a waitlist when you sign up. However, if and when you get in, this is a great low-effort way to get a little cash back. Walmart Savings Catcher - This is another low-effort way to get cash back! The only catch is that you have to shop at Walmart and, I think, your cash back is only good at Walmart with the new system they're rolling out. But still. Love it or hate it, we all shop at Walmart, right? With this program, you just scan the code at the bottom of your receipt, Walmart will compare what you bought to all the ads in your area, and if any other store is running a sale that beats the price you paid at Walmart you're awarded the difference. Over two years I've probably only gotten about $50 back this way, but that is $50 for probably a cumulative 3 minutes of actual effort. Another good point to ponder is that I don't think any of these apps take into account if you use actual paper coupons in the store. So stack your coupon and app earnings away! So I often scan one receipt into all four of the apps above, I may have paper coupons, AND I probably paid for it with my cash back Discover card. That's right. I think I will claim the title of Cash Back Queen if it's not already spoken for. 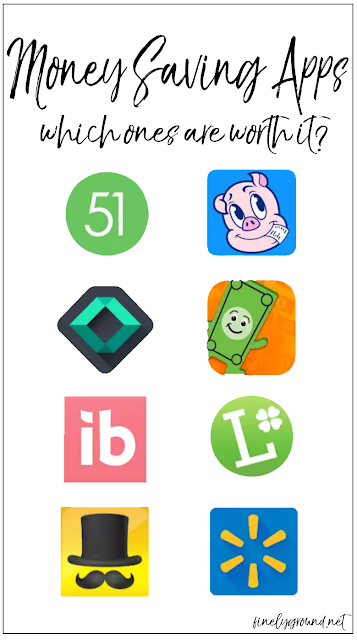 Switching gears, here are some apps where you can earn cash from your couch, no spending required. InboxDollars - If you are trying to make money online I can guarantee you will be inundated with information and offers about taking surveys. And you can spend the next five hours of your life taking surveys and probably only get about 5 bucks out of it. So I'm including InboxDollars mainly as a token survey app. They aggregate a handful of different survey platforms--there are other ways to earn money as well, from watching ads or downloading apps, etc. I think I've even gotten $0.05 for tapping a notification from them when they detected I was walking into Walmart or something. HOWEVER, their cash-out threshold is $30. And in playing with InboxDollars off and on for literally years I'm still only at about $8. So if you're set on trying out surveys, I recommend InboxDollars from their sheer variety. But in my opinion, this is probably the least useful app I'm including in my list today. Lucktastic - Watch ads, scratch scratchcards, and earn "coins" which you can eventually exchange for giftcards. With every scratchcard, there's the chance you could actually win a lot of money -- but if you aren't an extremely lucky person, you'll just slowly earn coins through this thing. It is a visually appealing app. I earned a giftcard out of it fairly quickly....But I felt like it was using a lot of data on my phone plan, and wished there was an opportunity to redeem to Paypal. So I ditched Lucktastic in favor of Lucky Day. If you're cool with giftcards, though, you might prefer Lucktastic. Lucky Day - Is similar to Lucktastic. Watch ads, scratch scratch cards, and earn "coins." I feel like this one uses a little less data, though, and you can redeem to Paypal. So this is probably my favorite app in this category. The link is a referral link, but I don't know if they give a sign-on bonus. I appreciate how mindless scratchcards are. You can do it while you're watching TV, for instance. SlideJoy - So this is an app which puts ads on the lock screen of your phone. I guess you earn points depending on how many times you open your phone in a day, maybe? I'm not quite sure how it works. But I tried it out. I think in about two months, I earned $2. I didn't end up keeping the app because I found it a little irritating. But if you don't mind an extra step to open your phone, this is free money. When I was writing this post, the link to their website appeared to be down. But it's easy to find in your app store of choice. The links to Ibotta, Lucky Day, and Discover are referral links, so I'll get a bonus if you sign-up through them. The rest are just regular links.